This year I've slowly been working on organizing and decorating our little office space. It's always been the downstairs dumping ground but I wanted to change that, especially since both Hubby and I use it as a creative space. It can also be seen from the living room with no door to close it off. I think the room is technically supposed to be the dining room but the internet hook up is in there and we have our table in the kitchen. It's coming along slowly, mainly because I'm terrible at organizing papers. 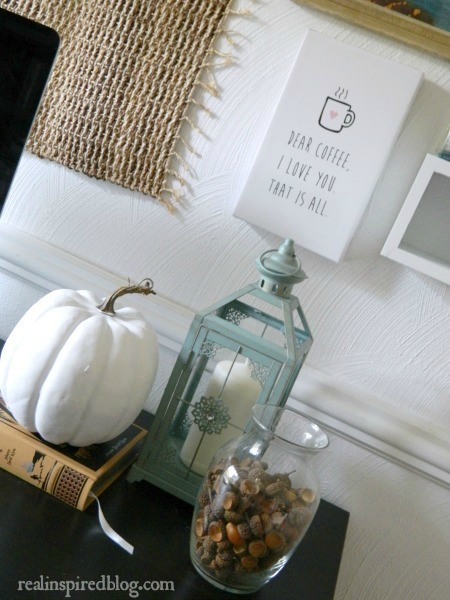 Give me something I can decorate with and I can organize it. Random papers, not so much. Hubby and I are working on that part together. For the longest time, we had a big, blank, white wall above the desk. Big white walls can be the equivalent of a white piece of paper that you have to write on for homework. It's a love/hate relationship. All that potential just waiting to happen, yet not knowing exactly where to start or where you want to end up. I finally decided to try a gallery wall. Over the summer, I have been picking up cheap art at various thrift stores around town. Mostly blue and ocean themed. I didn't really intend for that to be, it's just what I was drawn to. After the first few pieces, I knew I wanted an ocean themed gallery wall somewhere in our house. So I tried the office. 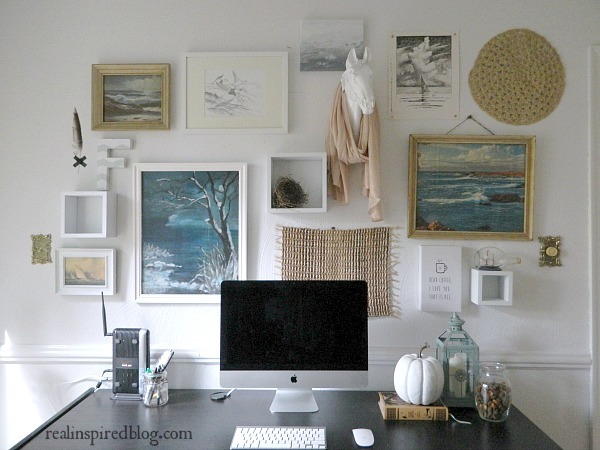 I wanted to fill our office with things that inspired us as we were working and so the ocean themed gallery wall morphed rather quickly into our quirky, nature, and ocean themed gallery wall. 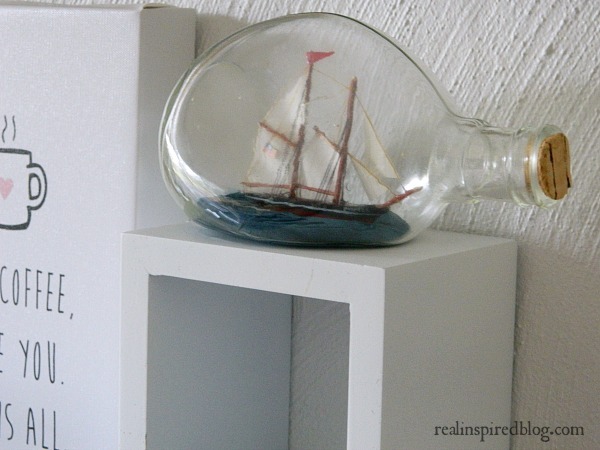 All the art (except the coffee canvas) and the ship in a bottle were found at the thrift store. I discovered the horse head at TJ Maxx. If you wander around my house a bit, you'll notice that I kind of have a thing for collecting horses. I had to send off a quick text to my sister and get her opinion on it. All the right kind of quirk, or weird and creepy? We decided quirky cool and I snatched it up. My coffee sign from Target had to find its home here in the office too. Because that's basically what this blog is run on. Lots and lots of coffee. The gallery wall will be gone soon because I'm making room for another piece of furniture in here(that I can't wait to tell you about because I am so excited about it!). 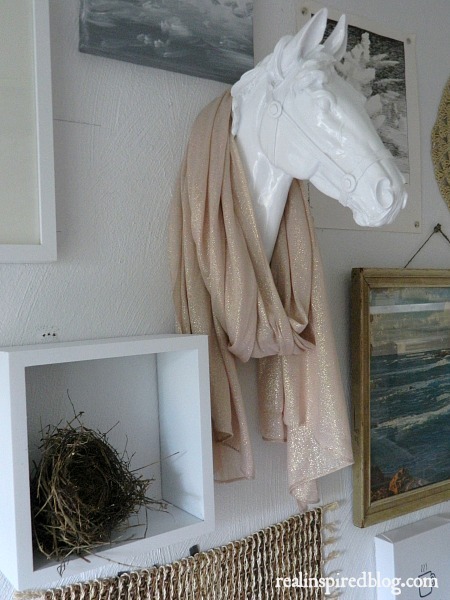 The horse head will stay but all the ocean themed pictures will be finding a new home. I know exactly where my new ocean themed gallery wall will go and I can't wait to put it together! I just wanted y'all to see it before it was dismantled. 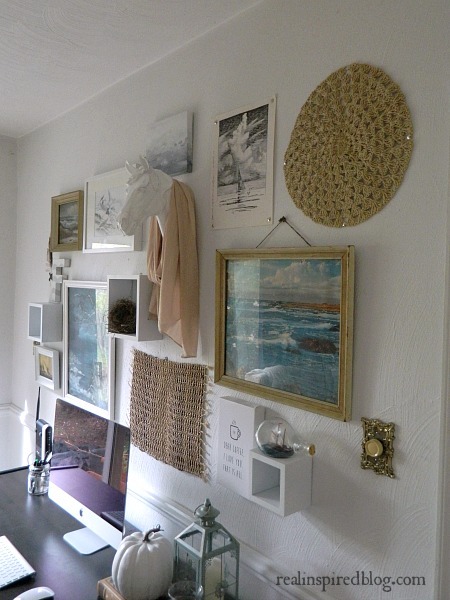 Would you do a themed gallery wall? 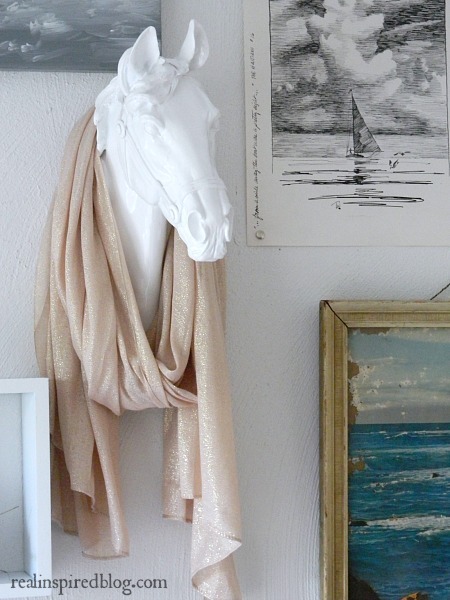 Would you hang up a horse head? Am I the only one that thinks that it's strangely cool?